I think you all can agree that there is nothing better than sometimes treat yourself with something nice right? 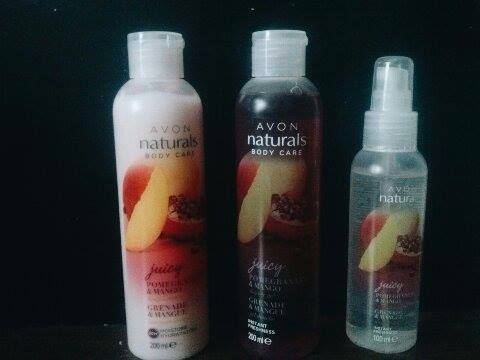 Avon naturals is a series consists from a body lotion, shower gel and a body spray with lots of different smells like blueberry, vanilla, green tea, rose cheery, jasmine and mango. Usually they have two different smells mixed together. I got myself mango and pomegranate set. They don't test on animals and is kind of really natural. Theses products really does smell like mango. It doesn't have a chemical smell and they're not overly perfumed like other products. My skin tends to get allergic to different shower gels and body lotions..these are the only ones that I use already for years and my sensitive skin loves them. If you are about to have a hot date use these tree together. Have a shower with the gel, then let your skin dry , apply the lotion and just minutes before leaving the house use the spray. Take spray with you and when ever you need to refresh use it. Don't worry theses are not one of those things that will make you smell like an perfume shop. Also a big plus to these are that the aroma stays on your skin many hours after. I used the body lotion yesterday and after 4 hour I could still smell mango everywhere. If you want to get some of these then search here for the online catalog and order online or ask some of your friends maybe some of them knows a consultant ...it will make things easier and you will get your set faster.